Blockchain technology is actively being integrated into the digital business world, so we cannot ignore all capabilities of this amazing innovation. 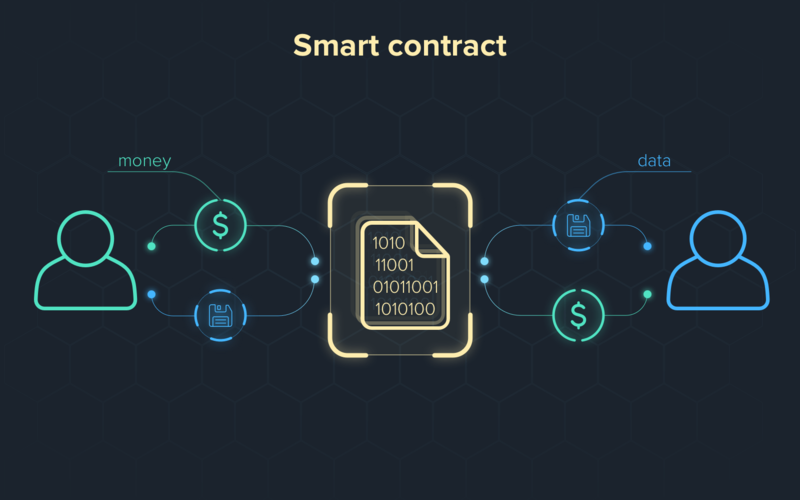 A smart contract is considered to be one of the most appreciable phenomena of blockchain and it brings the new level of agreement conclusion. It can help you improve your business negotiations and automate many processes. Then, the only thing you need is to hire reliable web developers. But first things first. Keep on reading and stay tuned! 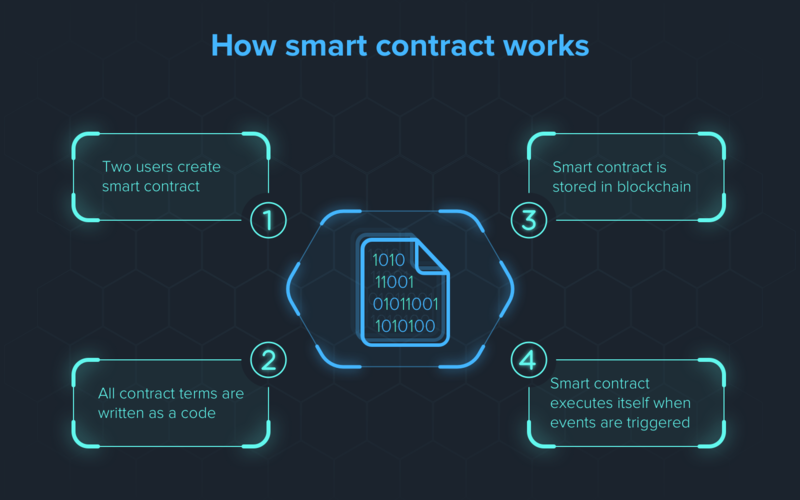 A smart contract is a computer algorithm that is developed for conclusion and endorsement of self-executing contracts that are implemented in blockchain environment. Such contracts are written in the code form that exists in the distributed register called blockchain, and this register is maintained and managed by the network of computers. Smart contracts blockchain make it possible to exchange money, assets, property etc. safely and directly without any intermediaries. Usually, if you want to make a deal, you should find a lawyer, pay for all documents and wait until all paperwork is done. In most cases, some rules of such contracts can be violated during the fulfillment. And if some terms are not fulfilled, one party should go to court, sue, spend money for a lawsuit and prove its claims. So common paper contracts cannot be the reason for the confidence building between two parties. Why is smart contract better than a traditional one? Let's imagine one of smart contract examples. You want to buy a second-hand smartphone via an ordinary platform where people sell and buy different things. But you have obvious doubts that smartphone seller can cheat you and will send you nothing when you prepay. Both parties are worried about possible fraud. That is where a smart contract can be beneficial. A special software is monitoring and controlling how both parties fulfill their obligations that are indicated in the contract, and it can automatically levy fines for violation or non-fulfillment of bargain terms. Smart contracts solutions provide parties with a safe bargain and make it impossible to violate well-defined terms since they are based on cryptography. Thus, a bargain becomes more profitable since participants don't need to pay lawyers, intermediaries or sue for contract non-fulfillment. Besides that, fulfillment of all terms is moving without the attraction of third parties. By the way, do you know what contract type it is better to conclude when you start dealing with software development company? Click the link and article will give you useful tips. Now you know a smart contract definition, let's study how it works. Smart contracts are based on blockchain technology, as we mentioned above. You can read more about it on our blog. In short, it is a distributed register that looks like a decentralized system and it is located on many computers that are connected to one network. Blockchain makes it possible for users to make transactions, transfer information and securities without banks and intermediaries. So blockchain and smart contracts are interrelated inextricably. And what is the principle of smart contracts functioning? First assets and contract terms are coded and put into blockchain block, then a contract is stored distributedly on a large number of nodes and it is fulfilled when terms are activated. Fulfillment of obligations by parties is verified automatically. A smart contract is such type of software that is created on the basis of computer logic and transferred in code form. That is the reason why all participants in the bargain or agreement can be confident that all contract terms will be complied with, and none of the participants will be able to change terms for them. This is how smart contracts work in blockchain. A code is the basis of Bitcoin or Ethereum smart contract, it doesn't matter what platform you use. So smart contract developer can help you here. Cleveroad company has experience in the development of blockchain systems, so smart contract is the niche we can deal with. There are a few important things you should have if you plan to find out how to create a smart contract. The subject of the contract. Software should have access to goods or services that are indicated as the main basis for contract conclusion, and this software should be able to deny or grant access to this service. Digital signatures. All participants initiate an agreement that should be signed by their digital keys. Terms of agreement. All terms of blockchain contracts should be indicated consequentially, that is the sequence of all operations should be available obligatorily. All participants should sign these terms. Decentralized platform. A smart contract is put into blockchain of this platform and it is stored distributedly on all nodes of this platform. Multisignature is the most simple way how smart contract can be used. With the help of such signature, participants of agreement can freeze a certain amount of coins, and if somebody wants to spend it - more than a half of participants should sign it to unfreeze it. Such important terms make it possible to secure all funds invested in the project. In case of any failure, all funds will be returned to investor automatically. If the necessary amount is collected, participants of multisignature activate their keys where they confirm a project bona fides. Smart contracts can be used for any financial procedures like insurance, registration or transfer of property, lending. But mostly smart contract applications are widespread in a business area where payment for services performed is the basis. 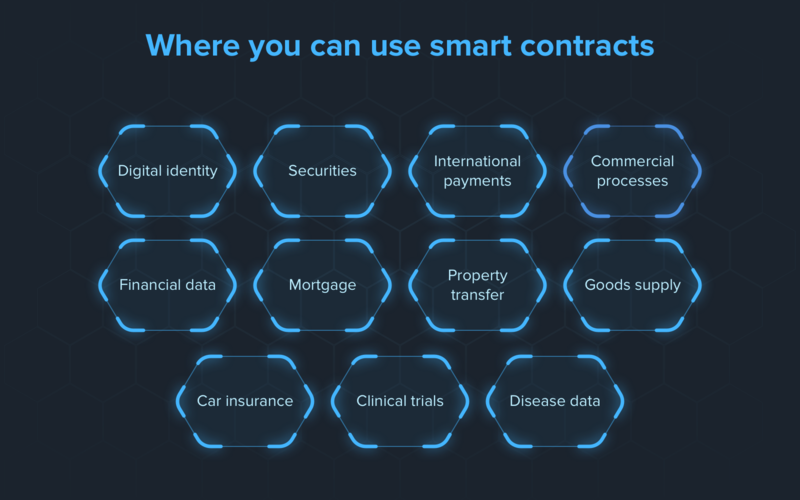 There are 11 main fields where smart contracts can be implemented, and we will list each of them. Bitcoin smart contracts, as well as smart contracts based on other platforms, make it possible to control your data, digital assets and so on. You can determine what data you will reveal to contracts, and what will be secured. Smart contracts help users bypass intermediaries when transferring securities. Automated payment of dividends and management of obligations occurs during this process. Usage of smart contracts when you make international payments is very convenient. Contracts make faster payment for a bargain with a guarantee, that is known as a letter of credit as well. Also, the liquidity of financial asset is increased. Smart contracts simplify commercial processes after each deal. All terms are indicated in the contract as well as all standards and certifications supplied services should comply with. In case of non-quality good supply, the vendor won't receive money and he/she will have to pay the penalty for the supply of non-quality service. Financial organizations can record financial data with the help of smart contracts. It will help combine all data in one register and simplify the exchange of information between organizations. It will lower expenses for audit and improve financial reporting process. Smart contracts make it possible to automate mortgage payments processing. The technology of smart contracts users will allow to transfer property without fraud. Due to smart contracts, it is possible to control the whole supply chain of goods in a real-time mode. Using web connection, it is possible to record the transfer of goods from warehouse to the shelf in a store. As for car insurance, a smart contract can store insurance policy and the record with the history of driving. It is possible to send requests after an accident to the Internet of Things that will be installed in many cars in future, and it will make it possible to establish the cause of car accident. Smart contracts help improve and modify clinical trials since they automate all data about patients and hand over information between clinics. Smart contracts can improve and simplify the transfer of personal disease data to keep anonymity. So the confidentiality of the patient will be protected. Let's slowly move from ways of application to benefits of smart contracts. A smart contract is encrypted and it is stored distributedly, so it guarantees the protection from the loss or unauthorized changes. So decentralized platform means a lot for smart contracts programming. Majority of processes are automated, and there are almost no intermediaries in this process, and it gives autonomy to users since they don't need an intermediary like a broker, bank, lawyer and so on. There is a large number of smart contracts for today, and you can choose the necessary one for a specific task. Due to automation and minimization of manual labor, the probability of mistakes and errors is decreased, and it is very important. Considering that many operations that were carried out manually have become the reason for a lot of mistakes. All interested users can monitor the progress of that or another deal. At the same time, all participants maintain confidentiality. All smart contracts are self-checking and self-executing, so people don't take part in this process. 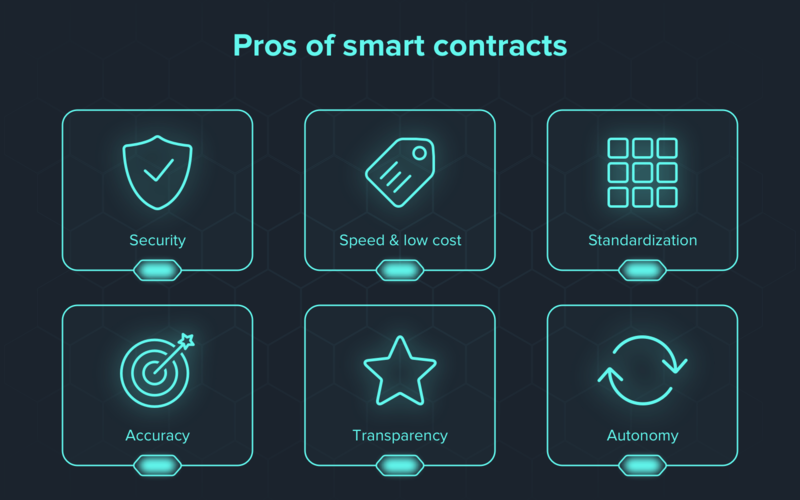 As you can see, there are some strong benefits that make smart contracts really amazing. But what about drawbacks, do smart contracts have it? There are a few disadvantages of smart contracts you should know about to understand what you can face. Smart contracts are created by people and they can also make mistakes sometimes. As blockchain is the basis for smart contract, it means that written code cannot be changed afterward. And one mistake can cost large losses in future. So developers should be very attentive. Today smart contracts are not regulated by government in any country. Therefore, if public authorities will make a decision to create a legislative framework for smart contracts, some problems may arise. The matter is that blockchain technology itself requires some revision. For example, scalability and transactions processing speed are not so high at the moment. All terms are programmed in advance. It is impossible to change something after its programmed. And it can be both advantage and drawback if the mistake is made in the beginning. Today many people use different blockchain platforms to conclude smart contracts. Bitcoin, Ethereum, NXT are one of the most famous and popular platforms. But each blockchain platform has its limitations for smart contracts. For example, some smart contract platforms require payment for smart contract building, and you should pay with cryptocurrency. Others offer only limited types of ready-made smart contracts templates. And so on. That is why the best way is to order a custom smart contract development from professional software developers. To build a smart contract, developers will also use one of the blockchain platforms, but they can use it more deeply and customize the contract according to your needs. Cleveroad specialists can assist you in this process at reasonable prices, because outsourcing development to Ukraine is very beneficial, and this article is just one proof to it. If you want to learn how to make a smart contract of your own from scratch, our developers will give you useful tips and they consider all your requirements to create a custom smart contract since they have enough experience to work with blockchain technology. All you should do is to contact us and describe the goal of your project. Cleveroad specialists will find the most appropriate solution for you. Subscribe to our blog as well, the button is on the right from you!